You’ve seen the venues. You’ve read up on the authors. 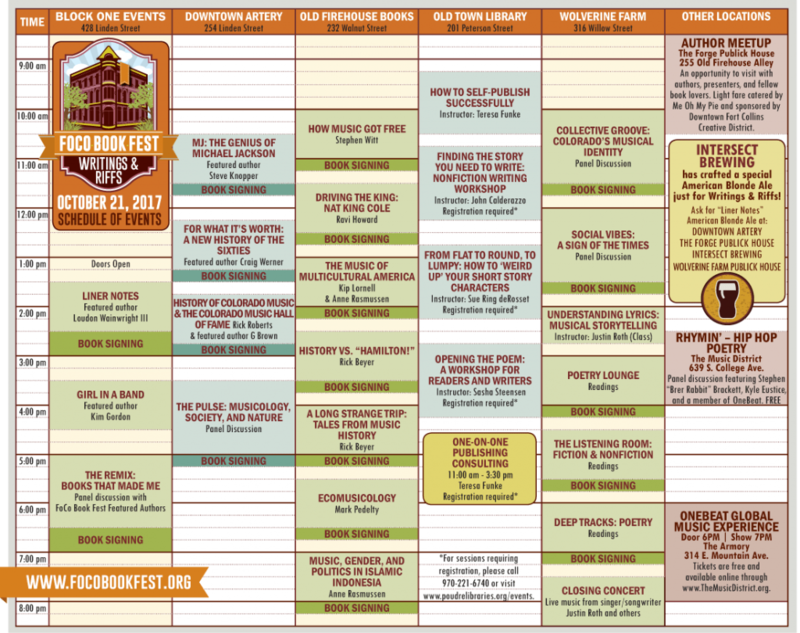 Now it’s time to take a look at the #FoCoBookFest schedule! We’re extremely excited about the diverse selection of topics being presented at Writings and Riffs. It’s a great blend of music-related themes and the literary arts. So, there’s bound to be a number of presentations, discussions, readings, or workshops that will interest everyone. The full schedule can be found online. Writing Workshops: As with last year’s book fest, the writing workshops require registration as space is limited. Register by calling the Poudre River Public Libraries Answer Center (970-221-6740) or sign up online. If you’re interested in working one-on-one with author Teresa Funke to learn more about the publishing process, her 30-minute consultations also require advance registration. Collective Groove: Colorado’s Musical Identity. Colorado’s identity is comprised of skiing, hiking, craft beer, bikes, and (we wish) books. Join this impressive group of music specialists—multicultural musicologist, Kip Lornell; Colorado musician and composer, Rick Roberts; journalist, Stacy Nick, and Colorado musician and music blogger, Greta Cornett as they discuss a sixth spoke in our identity wheel—Colorado music. Driving the King: Nat King Cole. Author Ravi Howard discusses ways that writers use narration and character development to create a sense of depth in characters, even when they are silent or guarded. For his recent novel, Driving the King, Howard was challenged to create an off-stage persona of a well-known musician, Nat King Cole, and to find ways to create a sense of interior with characters who were in this exterior world of performance. Ecomusicology. Dr. Mark Pedelty argues, not only can music help make our communities more sustainable, it’s essential for doing so. He makes the case empirically, showing how several artists have made tangible contributions to sustainability and environmental justice through performance. In addition to a reading and discussion, a few songs will be performed as illustration. How Music Got Free. With the success of streaming, the 20-year era of music piracy draws to an end. But what actually happened during this reign of terror? What lessons can be learned? And, most importantly, who controls the future? Stephen Witt, the author of How Music Got Free, tells the story of the scientists, suits, and smugglers who made the contemporary era possible… and what things may come. History vs. Hamilton! Lin Manuel Miranda’s mega-hit musical Hamilton! has wowed audiences with its stunning musical score and intricate portrayal of early America’s complex politics. But exactly how accurate is the history that Hamilton! Rick Beyer, author of Rivals Unto Death: Hamilton and Burr, explores what’s fact, what’s fiction, and what juicy plot points never made it to the Broadway show. He is joined by his son, Denver-based musician Andy Beyer, founder of the music project Sonic Geometry, for an entertaining song-by-song look at History vs. Hamilton! Music, Gender, and Politics in Islamic Indonesia. Ethnomusicologist Anne K. Rasmussen describes her teaching, research, and community-engaged activism. Using examples from her book Women, the Recited Qur’an, and Islamic Music in Indonesia, alongside fresh research on Islamic musical arts, Rasmussen shares her perspective on the intersection of cultural production, gender, tradition, modernity, as it plays out on the stage of Islamic music in Indonesia. Complete session descriptions and the event schedule can be found on the Schedule page. You can also preview the festival program online by downloading a PDF copy. Print programs will be available at all venues the day of the event and at various locations throughout Fort Collins prior to the festival. Schedule and authors are subject to updates. The most up-to-date event info will be made available on our website home page.